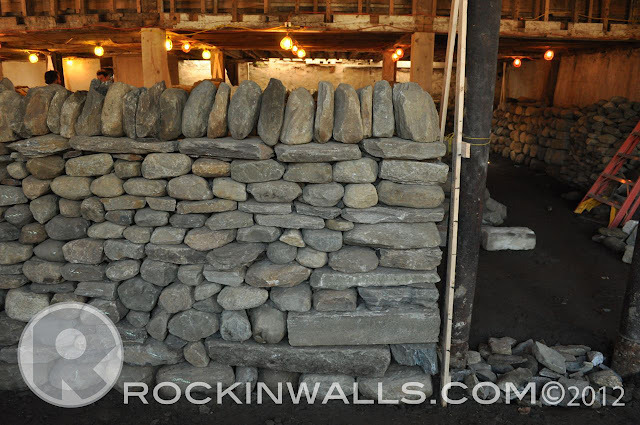 I wanted to take a moment to show some examples of wall stone used in building a dry stone construction. 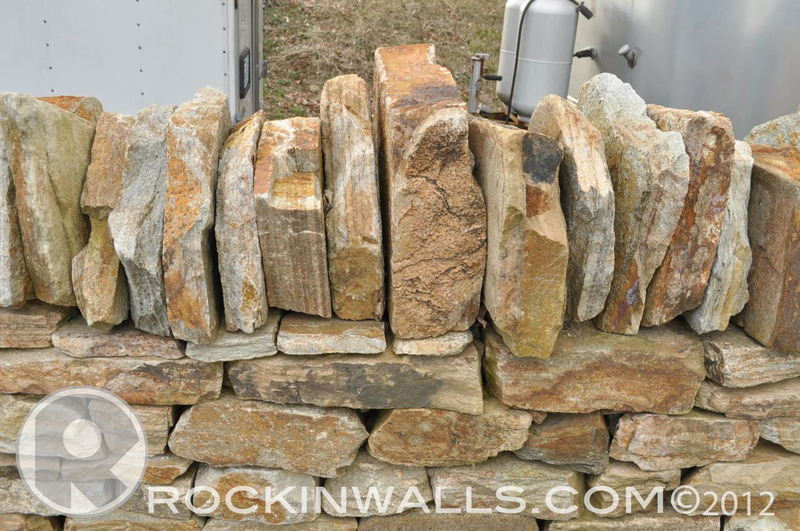 Stone needed for your wall may vary depending on style, region and available materials. Did I miss any thing? Foundation stone should be some of your large solid stone which should lay flat on earth. A good solid foundation is the start to anything good. You don't build a house on a crappy foundation, same goes for a wall. The better your foundation the easier your wall will go up. 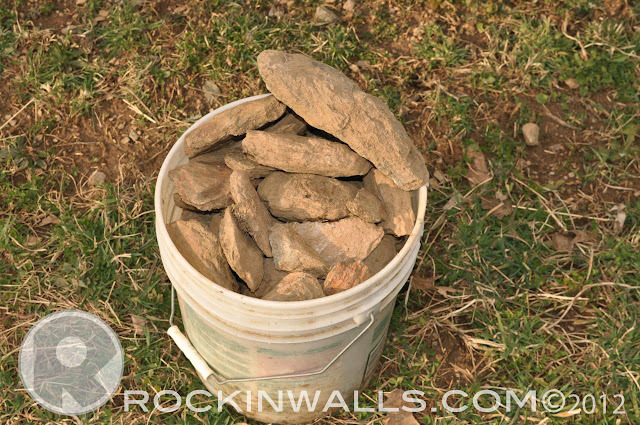 For my walls I try to find stones which range from 4-6 inches. Stones larger then this are hard for me to find plus difficult for one man to place and set. Packing Stone / Hearting - These are the small stones used to help put between the voids of your larger stones - face stones. Without a well packed wall, things are destined to fall apart. I've had the opportunity to see a few walls fail because of no packing or lack of it. Keeping things easy I normally run to my local stone yard to pick up about 5 tons of yard material. As seen in this pic above. I get a little of everything in the mix. Stones range from BIG to stone dust. I use what I can. Saves me a lot of time. Otherwise I just go hiking in our horse pastures to gather up contractor buckets of stone. A bucket of stone really doesn't go that far on a wall. So if your planning to gather - have a lot of buckets and time. 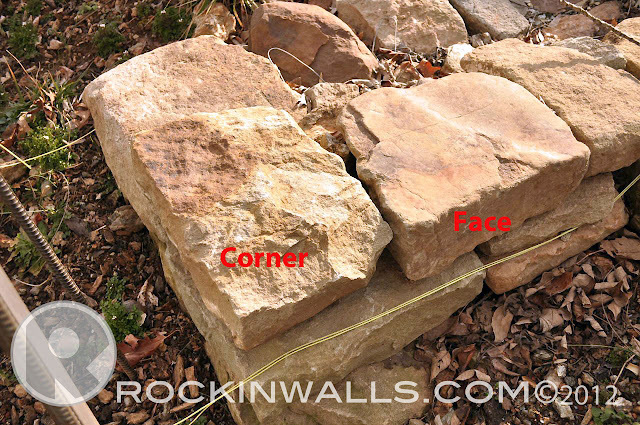 Corner Stones - If your wall includes corners you will need to be sure to find and put aside any stones that happen to have square edges. Another corner stone - right side and bottom back this will make a great right corner as seen on the upper picture. Face stones or building stones - I've marked the stones with red dots which have good faces. A stone with a good face also needs to be placed into the wall with length in. A stone that is 8 inch min. length is key. Otherwise the stone would not be structurally sound for building. Such as a tracer. 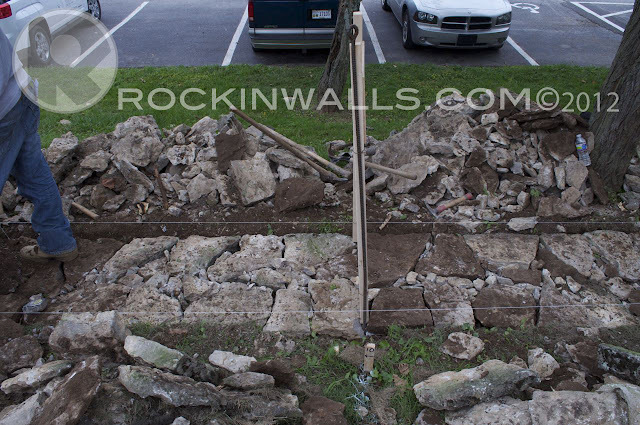 Stones which may not have as nice faces can be used on the back side of a retaining wall. On free standing walls you should always have your facing stones facing outside so you can view them. 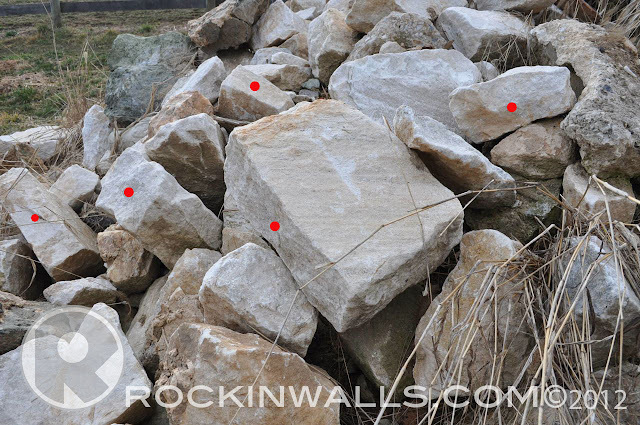 It takes time to spot face stones unless you have alot of nice stone. Or you spend a little bit of time shaping. Little by little one will learn how to spot stones - stones for building walls. Find the shape you need and fit it into the wall. This pictures is an example of face stones being placed into a wall. Notes: stones will vary from area to area such as rip rap - stones which may have a shape such as football triangles.... etc. Or notice the wall below. Tie Rock or Through Stones - These are the long stones which need to be the width of the wall then a couple more inches if they protrude out of the wall. This is a common practice on most walls but not all. 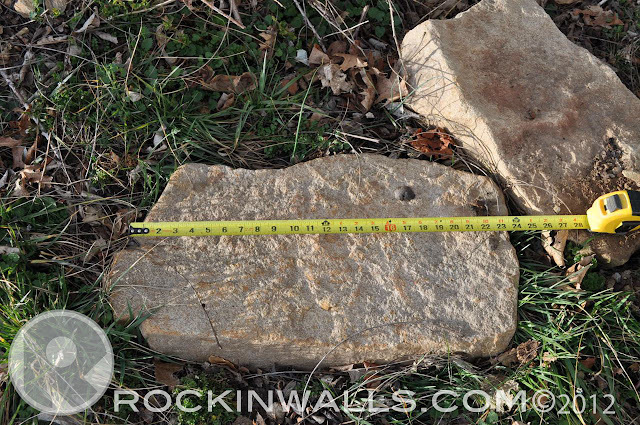 These stones above are 24" - 26"in length. Intended for a freestanding wall I'm building which is 4' high. Same as size as pictured below. 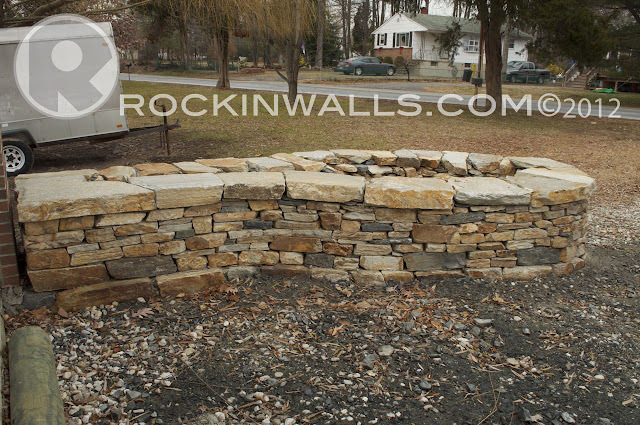 This wall was built at the Stone Trust in Vermont. 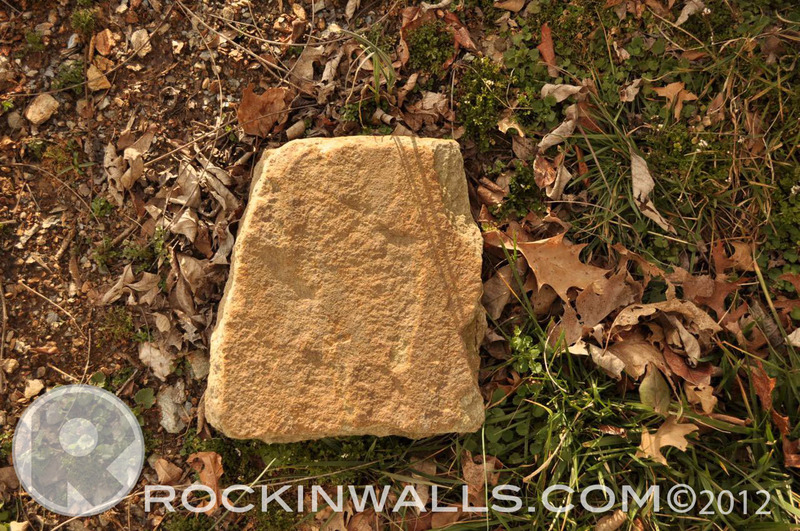 The stone has some nice looking square stones along with a lot of rounder rocks. 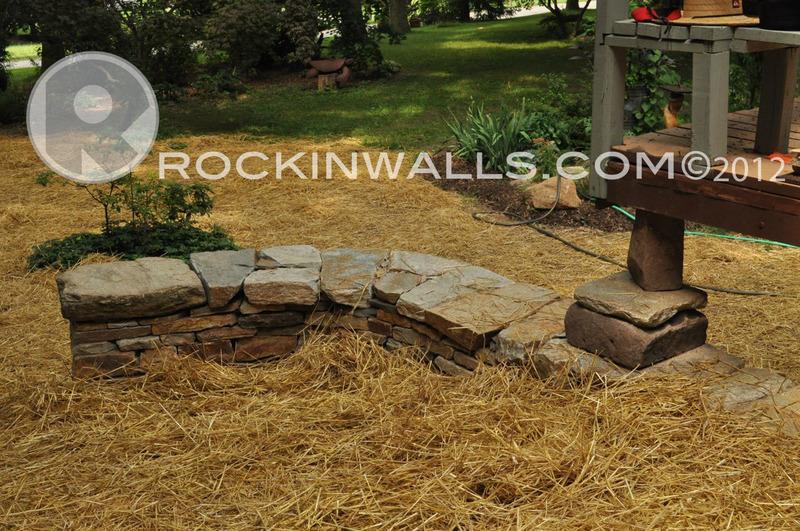 Cap Stones / Covers / Coping- From region to region, customer, waller, or stone type caps will very. In the United Kingdom or Kentucky it is not uncommon to see vertical coping. The wall above has large flat cap stones with vertical copes. Cap stones should always have some thickness, size and weight. A stone which is too small may easily be knocked of the wall. I have seen a few walls in my area built by landscape companies who sometimes build a nice wall but don't use any stone with mass on the top. This is how I built my first two walls when I didn't know any better. Without good caps the wall will not be solid. You can think of it like the tie stones or a boat anchor. You need something to keep the boat from moving right? Or how about a cake without icing on the top. Might not be as good without it. I love icing. Random vertical coping without flat caps under them. If you can use a flat cap under, your more likely to keep water out. If you think of a roof - you normally have a little overhang this allows the water to roll off the edge away from the house just as it will with a wall. For example if the top of the wall is 12" a 16" will give you 2" of over hang on each side. I've seen a lot of historical walls without the flat cap stones under the vertical caps in Kentucky. Most are still standing. The reason for this is - finding enough large stone is not so common when you have miles and miles of fence (dry stone walls). These stones I had to place with a skid steer. They are 2 person stones ranging about 4" high by about 24" wide and 20" length in size. This wall was built as a seating wall for the client. The back side are smaller stones but still have some extreme weight to them. The best thing about Dry Laid Stone Construction. Very little stone is wasted when building. When you're building a wall picking and sorting stone remember what stones you will need for each part of the process. If you spot them early on you will save yourself a great deal of frustration later and $. Not to mention your wall build will be more like a well oiled machine. Just don't spend all day sorting stone. 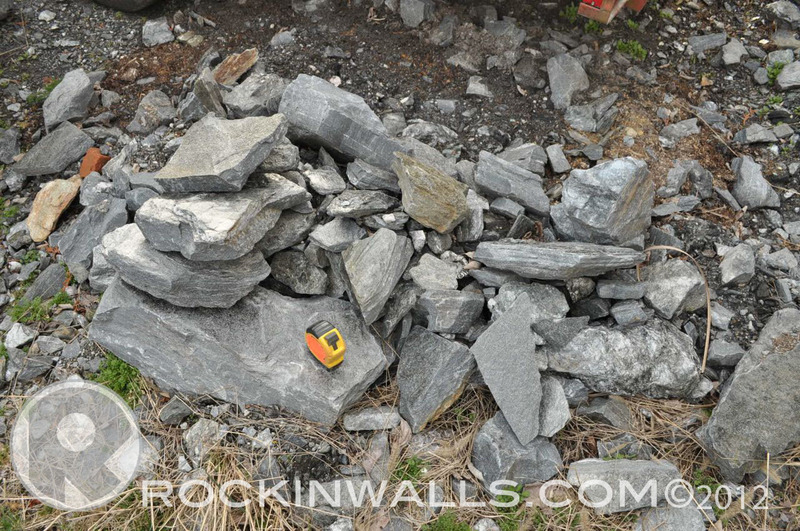 It can be easy if you're new at walling to become obsessed with stone. Gather and build, gather and build!!! Other helpful Image on Stone Trust "Your Wall"
This may be a little off subject, but I think it fits. I read (somewhere!?) that an expert dry stack builder should be able to build a 5' high by 8' long section of wall in an 8 hour period. In your opinion is that accurate? 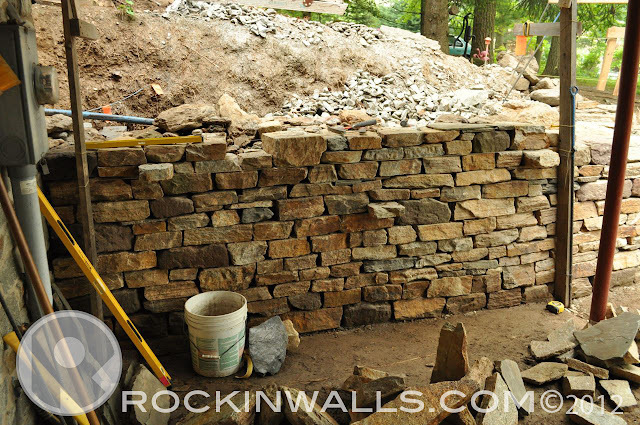 I think I read on one of the dry stacked stone builder pages that in order to obtain master builder status you must build that size wall as part of the test, along with making it structurally sound and following all the tips in this post.